Just wondering if anyone is interested in painting a National Airways Corporation [NAC] of New Zealand livery. May I please request this lovely Finnair livery please? when ready , place it on the 'repaints to share 'topic please . Wow! That's fantastic! Would you consider the later Air UK livery please? Would any painter be kind enough to have a go at this paint please? She is an F-27 of "Air Niuginui"
Thank you very much Crankpin. I'll have a look for your PMDG 737 paints too. I just popped over to AVSIM after reading your last post and checked them out. Very impressed. I do really like the Kakoda one too. Great work! I had left PNG buy the time they got the 737. They had just retired the 707 and had received the A310, with that amazing greater bird of paradise "Kumul" motif down its fuselage. Never got to ride in the F-27 but did a few trips in their F-28's. Great times in PNG. 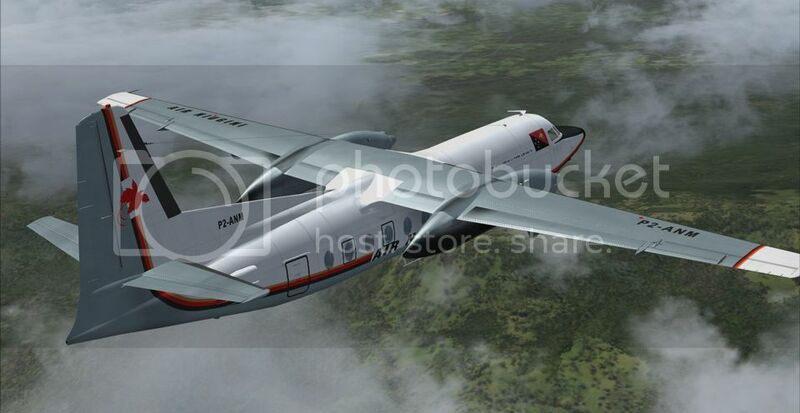 Air Niugini F27 P2-ANM on delivery flight and approach to Jacksons Port Moresby. She looks fantastic!! Thank you very much Crankpin. May I post a link for her over at OZx? There would be a few chaps very interested in her there too.